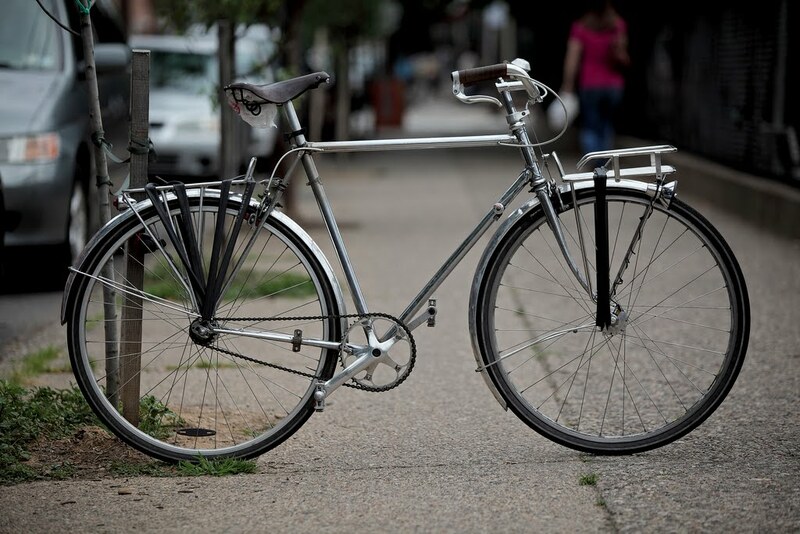 No longer do commuters have to lock bikes to trees or other eco-friendly posts, well locking your bicycle to a tree negates the fact that you rode a bicycle instead of driving a car, as you are abusing and killing that tree. Cycling around the city is an obvious way to save money and reduce your carbon footprint. The only negative thing about biking to work for me and many others (besides dealing with angry motorists) is that it can be nearly impossible to find a spot to lock up in Center City. But, alas! 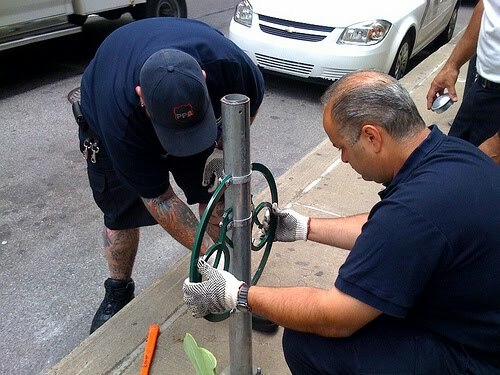 One of the 1500 rings purchased by the city using funding from the Energy Efficiency Block Grant was installed this week in front of my office on Walnut. The first microbrew I drink at whatever Beer Week happy hour event I end up at after work will go to Mayor Nutter, the PPA, and the Bicycle Coalition for making this happen. It is great that we can use the parking meter posts again, as they are everywhere in Center City Philadelphia, headless without meters since they introduced the parking meter kiosks. We did not buy it, but we should have, or more importantly, I should have for myself. It was a cool bike, outfitted with BSA bits. Notice the Schwinn Paramount style dropout adjusters. This Bastide fork was seen at Cirque, not for sale. This is a great documentary about the spectacle of the Tour de France, from the mid 1960s. No narration, just found sounds and some music. not the best video quality, but I think you can get past that. Dura ace 10 pitch, cool ol' track handlebars, vintage campagnolo derailleurs, Brooks and Ideale saddles. my friend Alan visited and then blogs about it. My friend Alan has a cool bicycle blog - Cycling Weapon of Mass Destruction- and when he was in town a week or two ago, he happened to catch me at work, I sold him some rare bits and I even let him borrow my city bike for the day, to ride around Philadelphia. His blog has cool track stuff, like Dura Ace 10 pitch, and follows cool auctions on Ebay, definitely worth a look. 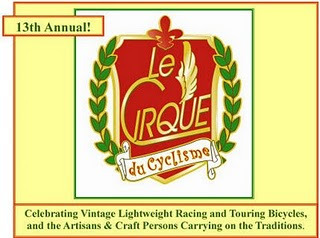 Cirque du Cyclisme is this weekend, and I highly recommend your attendance. It is the premier lightweight cycle collector event in the world, and every major and minor marque can be gleaned over in the bike corral on Sunday. The bicycle swap meet does turn up some amazing finds and great deals. Rare Mafac Tiger, wide spacing between the pivots for clearance of larger tires and fenders. Weinmann engraved centerpull brake, late 1950s. First generation Mafac Competition brake, engraved.